Located in the Central Manufacturing District in Vernon, a few miles of downtown Los Angeles is the Strongheart Packing Company, they made dog food. 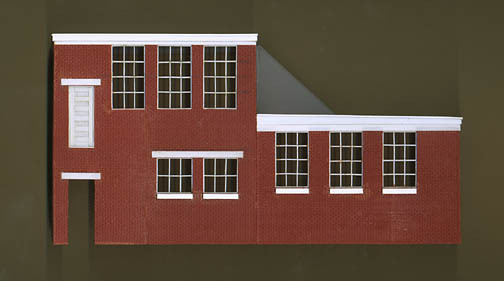 I choose this industry to model in HO Scale as it had interesting roof shapes and brick and sheet metal walls. The Strongheart Packing Company (see red arrow), is shown on this industry switching map of the Los Angeles Junction Railway. 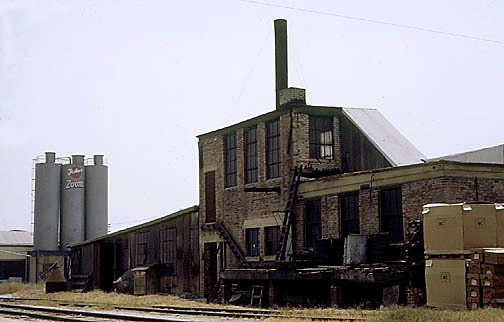 Fishers Flouring Mills, known as the Zoom Cereal Factory had its own siding with many spots for rail cars. 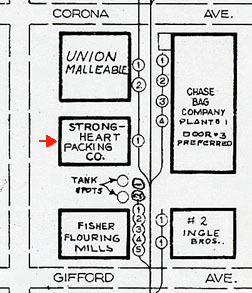 Strongheart had only one spot but same spur track served other customers such as Union Malleable Company. 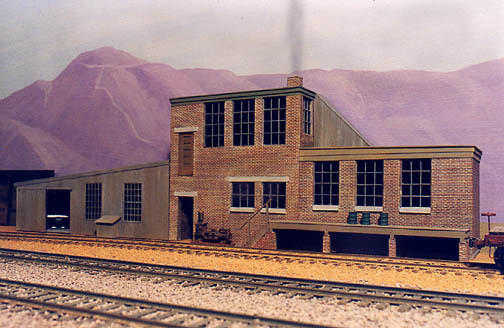 The Low Relief model was built like the prototype, as there is no freight doorway into the building from the loading dock, maybe tank cars were unloaded here by using a large hose line. I also didn’t add the smoke stack as the prototype has, because it would have cast a shadow on the backdrop sky. I wanted the building to look old, but as if it were still being used, but not falling apart as seen in the above prototype picture. I added outside details such as the portable steam pump on wooden skids for tank car unloading. Seen on the metal shed side of the building I changed the model to a sliding door with machine tools inside such as a lathe and mill, this needed for an industry to keep the production equipment in repair. To begin construction, I started on the central part of the building first. I figured it had a floor space inside of about 24 feet wide, this making the outside 26 feet wide, and the same for the height. The materials used are plastic brick sheet and Evergreen styrene. I cut the brick sheet to size then cut the window openings following my drawing (seen below). 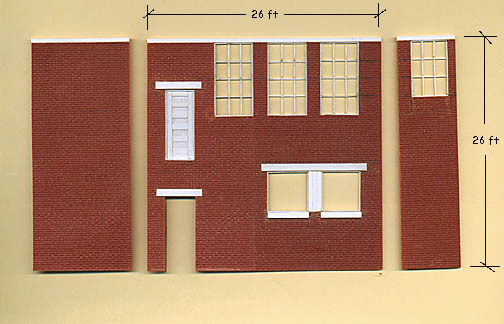 I build up all the windows into the brick sheet using Evergreen HO 2″x 4″ for each frame and 2″x 2″ stock for the frames. This is done before gluing the walls together making window assembly easy. 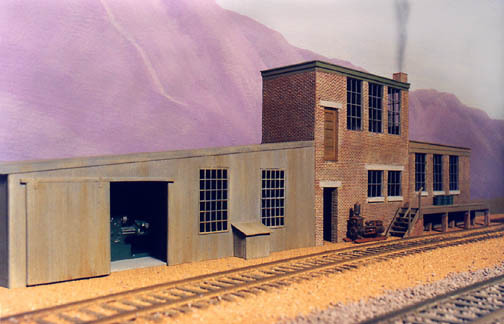 Here is the factory somewhat complete, still have more to finish, such as building the metal siding structure seen at the far end, and the loading dock. 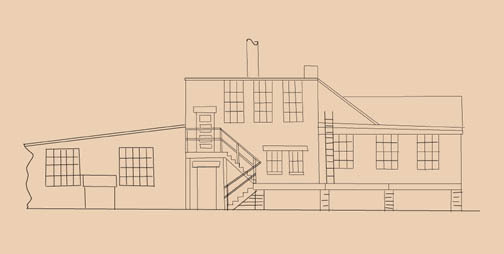 I drew the factory in proportion to the photograph. I use door and window openings to figure the size of the building because I didn’t take measurements some 35 years ago when I photographed it.